Soon after Oak Wilt was identified in Texas, a program was initiated in the Department of Plant Pathology and Microbiology at Texas A&M University to develop a management program for this major problem. The result is a program utilizing both cultural and chemical approaches to disease management. The chemical approach employs a fungicide that effectively combats the fungus. 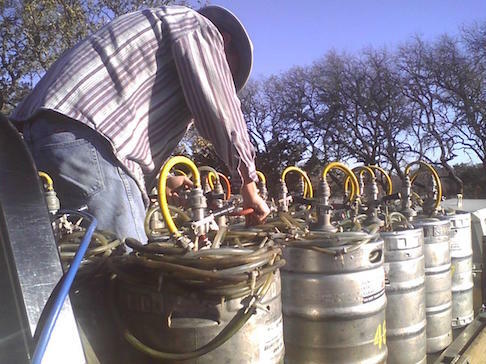 University researchers, agriculture extension agents, the Texas Forest Service, arborists and property owners were all involved in evaluating potential pesticides. Candidate compounds were applied in many different ways: foliar sprays, soil drenches, and tree injections. It was not until the early 1980s that a fungicide containing Propiconazole (the active ingredient in AlamoÂ®) injected into symptomatic and non-symptomatic trees was found to be effective in controlling symptom expression. 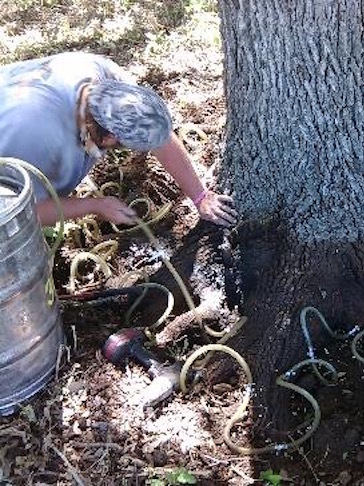 Because Oak Wilt affects the entire above ground portion of the tree, the technique for application of the product (Macro Flare Root Injection) is the most effective. 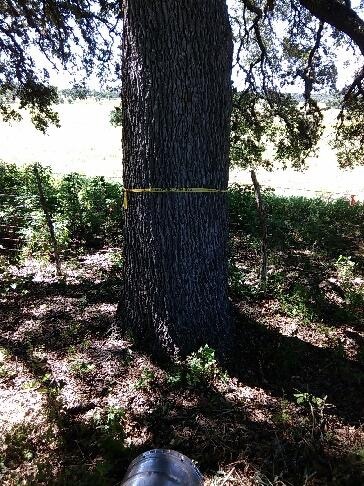 Many years of field application have proven that AlamoÂ® when applied via Macro Flare Root Injection is a very effective weapon against Oak Wilt. In fact, if the procedure is performed correctly on appropriate candidates and repeated as necessary, survival rates are 85% or better. When compared to a survival rate of 15% for untreated trees, the success of treatments is quite good. Oak Wilt symptoms appear after substantial internal damage to the tree has occurred. While the fungicide can kill the Oak Wilt fungus, internal damage is not reversible. This is why the treatment is best performed as a preventative measure. Most trees that are treated preventatively do not experience a high degree of internal damage. â–¶ï¸Ž The distance of the tree to be treated from the nearest known diseased tree. â–¶ï¸Ž The lifespan of the treatment. The Texas Forest Service has utilized aerial photography to determine the expansion of Oak Wilt disease centers. The advancement of the disease averages 75 feet per year. However, there are large variations of disease spread. Many centers expand faster or slower than the average. In addition, the disease movement is often not the same in all directions. Disease center expansion is also dependent on weather conditions and tree population. Both wet weather and high tree density appear to accelerate disease movement. Research has shown that the effective lifespan of a treatment is about 2 years. Generally, two fungicide applications are required. The time frame between injections is 18 to 24 months. For large trees the interval may be shortened to 12-18 months. After two or possibly three treatments, the threat has usually passed a particular area and further treatments may not be necessary. Inspection of your trees by a Certified Arborist on a regular basis is recommended to verify that the risk of disease has passed. While the best time for tree treatment may be in the spring after the new leaves have set, successful treatments can be made at any time that there are sufficient green leaves on the tree to be treated. 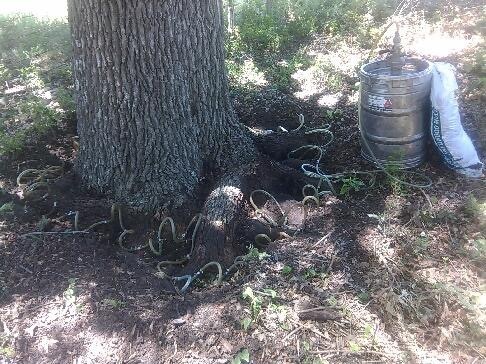 We have found that if the Oak Wilt threat is imminent, a treatment should be made soon to avoid major damage. When you couple treatment timing (disease movement and treatment lifespan) with the fact healthy trees benefit more from treatment we are left with the following conclusion: The best trees to treat are those that are not symptomatic but will be challenged by the disease in the next 12 months. Considering the rate of disease movement, trees closer than 100 feet to a diseased tree benefit the most from treatment. Infected trees in early stages of symptom expression can be treated, but their chance of recovery is much poorer. Although trees with symptoms have a lesser chance of recovery, high value trees with special significance to the property may be selected for treatment. Property owners usually have difficulty making treatment choices. Economics generally prevent a "treat every tree" strategy. One of the greatest services we provide is the thoughtful selection of treatment candidates based on timing, aesthetics, health and budget. We work very hard at putting ourselves in your situation when working out a treatment plan. The cost of treatment is typically based on the diameter of the tree as measured about four feet high on the trunk. If the tree has more than one trunk, each one is measured and the total becomes the "diameter". The reason for pricing a treatment this way is straightforward. The amount of chemical used and the amount of labor required to excavate and set up each injection point is based directly on the diameter. 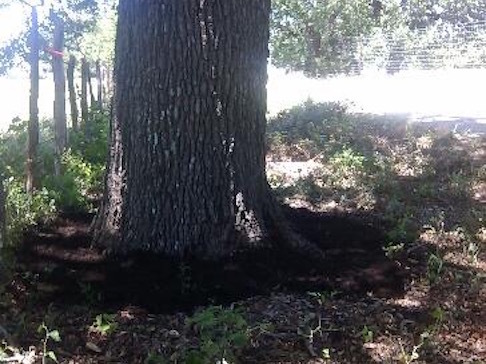 For most Live Oaks, we use 20ml of AlamoÂ® per inch of DBH (diameter at breast height) in up to one liter of water. For smaller trees, a dosage of 10ml may be appropriate. Our company is highly experienced at determining the proper dosage and amount of water mix to apply to your trees. We will provide a free written proposal for your injection project after we evaluate your Oak Wilt problem. During dry periods, trees to be treated should be watered one or two days prior to the treatment. A single long term soaking is preferable to several short term waterings. 1. We excavate the flare root area of each tree with an air spade. The air spade removes the soil around the roots quickly and with little or no damage to the roots themselves. 2. Injection points are drilled into the flare roots. 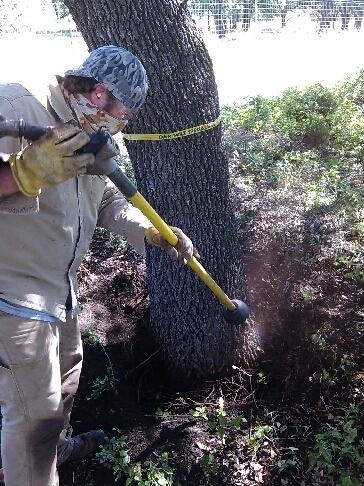 There are approximately 1 1/2 to 2 injection points per DBH spaced evenly around the tree. 3. The injection apparatus is connected to the tree. 4. The tree takes up the fungicide and water mixture. This process lasts from 2 to 48 hours depending on tree health and weather conditions. 5. After the tree has finished, we remove the injection apparatus and cover the flare root area with soil and mulch. 6. A small metal tag is affixed to the tree with a serial number. This serial number is entered into our "tree tag database" that records information about the treatment. Proper tree care is essential following treatment. Trees should be watered as needed, possibly treated with a growth regulator such as CambistatÂ®, and mulched. These practices do not control the disease, but are important to promoting tree health. Your particular situation will dictate the precise pre and post treatment tactics that are appropriate. We can help put together a plan that makes sense for your property. Trees to be treated are marked with flagging tape so that the customer and our technicians can identify treatment candidates. We use a tool called an â€œAir Spadeâ€� that uses compressed air to excavate the flare roots of trees with no damage to the roots themselves. Small holes are drilled in the flare roots and injection points are installed. Special care must be taken to identify good injection locations. The treatment containers are filled with the proper fungicide and water mixture. 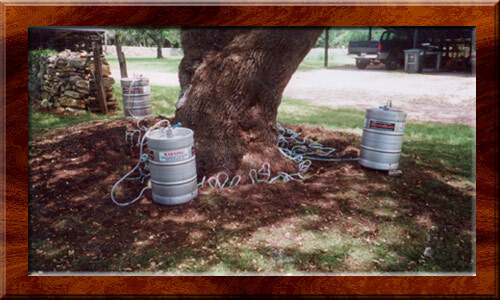 The containers are pressurized to bring the mixture to the tree. The treatment process takes from 2 hours to 2 days depending on tree health and weather conditions. After the treatment is finished, the equipment is removed and the roots are covered with mulch and soil.